I love a Fingerprint Guestbook. I think they’re such a welcome alternative to the traditional wedding guestbook – which if I am honest, causes me slight despair when I see one. I don’t know what it is, perhaps it’s the same as my inability to write a good greeting in a card, but I just never know what to write. Of course there’s place for classic guestbooks, but I like the idea so much more of a keepsake a newlywed couple can take home and hang on their wall. It will be something they will treasure forever – rather than a book that they’ll likely stash away in a loft space or back of a cupboard. So, what is a Fingerprint Guestbook? Incase you don't know what one is, a Fingerprint Guestbook (or a Fingerprint Tree) is an illustration of a tree with space for every wedding guest to add their fingerprint to. The thumbprints, stamped onto the artwork with ink, look like the leaves on the tree. Sometimes there are allocated spaces for the guests to print onto, other times there are no guide spaces, and guests are encouraged to write their name by the side, or on top of the fingerprint leaf they’ve added to the tree. The outcome of each wedding guest contributing to a single piece of artwork, is a special memento piece to display in the couple's home. They are a beautiful, personal piece of artwork, for the newlyweds to enjoy looking back on for years to come. What makes a Fingerprint Guestbook special? 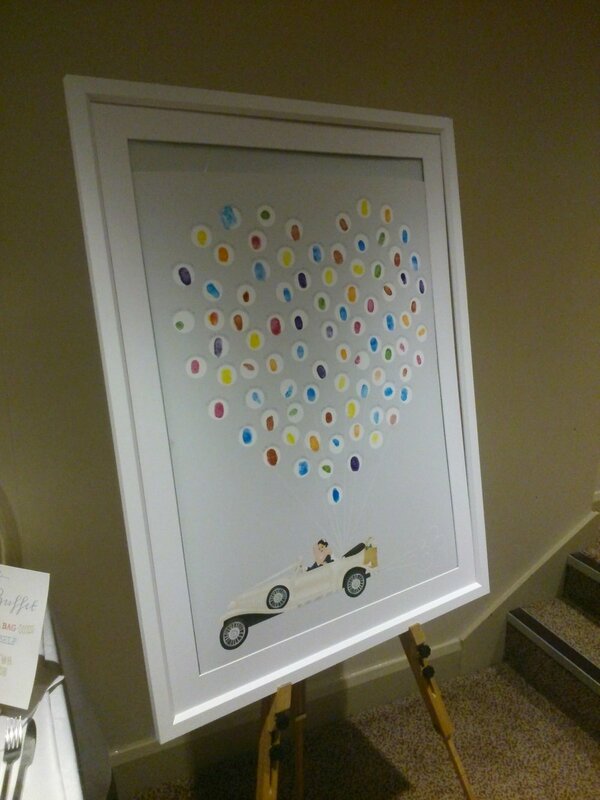 It will create a fantastic talking-point amongst your wedding guests, as each of them will enjoy being part of creating a piece of artwork for you. It will be an eternal memento of your day and the people that were part of it. I think fingerprint illustrations are a fantastic metaphor for the print that each of your wedding guests make on your life. 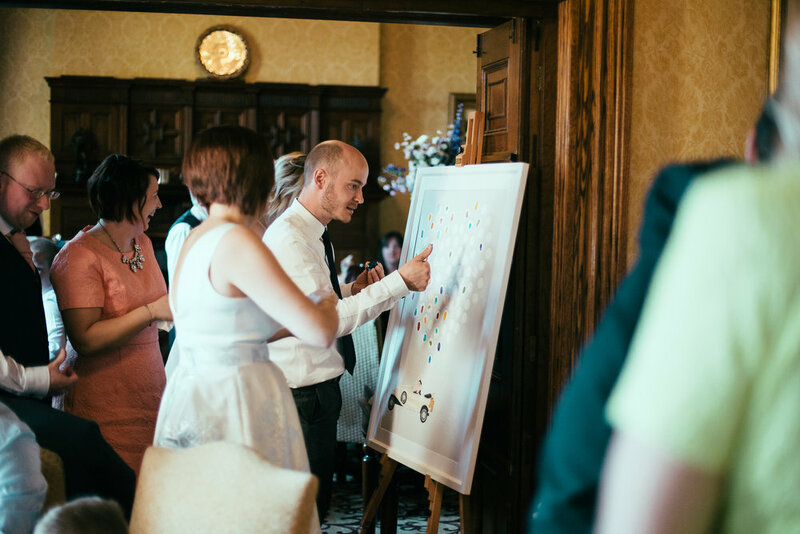 By commissioning one, you’ll have all of your loved ones' very own 'stamp' incorporated into your one-of-a-kind piece of art to enjoy after your wedding day, forever more. No of course not! The beauty of choosing something so personal for your alternative guestbook, is that you are not limited to just thumbprint trees. You can choose to incorporate balloons (or at least the strings that are tied to the balloons) into the design. The guests’ prints then become the balloons! A bunch of balloons work well 'tied' onto a bicycle, 'carrying' an animal or house through the air, or being held by the bride and groom. If ink is too messy, then choose for each of your guests to write their name in each of the leaves or balloons instead. If you’d prefer little messages, you may require slightly larger spaces for your guests to sign – these can be whatever shape you'd like. How about birds flying overhead, whimsical hearts or stars in the sky? 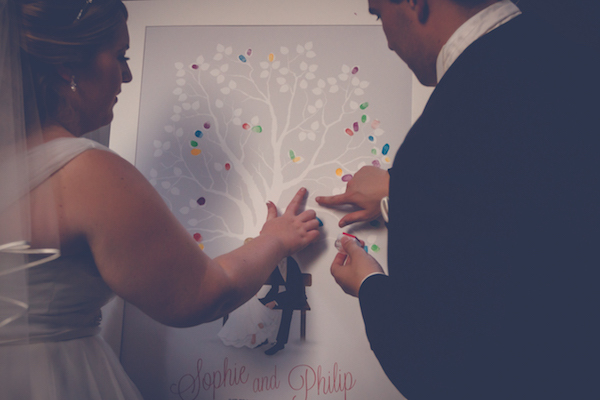 By the end of the wedding, the tree or design is covered in little fingerprints or signatures! Are they for weddings only? No, absolutely not. Whilst usually Fingerprint Guestbooks are used for weddings, they can also be used for any number of events; baby showers, births, graduations, hen dos and family reunions. You can use a piece of fingerprint artwork for whatever you'd like! I have a few simple tips for other things you’ll need to consider, to create your display at your event, and the best way to present it for maximum effect. 1. A Fingerprint Tree or illustration – Speak to me to commission yours. For inspiration, take a look at examples I have created for some of my customers here. I can arrange to have this giclée printed and framed for you – alternatively, you can choose to get this professionally printed elsewhere, and buy your own frame. There are some really lovely, ready-to-buy frames on the high street. Ink Pads: The best ones to choose are the fast-drying, archival inks. My favourites are the Dew Drop Ink Pads from Sticky Tiger. They are fingerprint-sized and they won’t fade. They come in lots of colours – choose just one or two colours to coordinate with your wedding palette, or go for multiple shades to create a really colourful piece of artwork. Pens: When choosing appropriate pens for your guests to use, make sure you look for ones which are acid-free with archival quality, pigment inks (so they won't fade or turn yellow). You'll want to be certain that they are fast-drying, fade-proof and non-bleeding, so that they stand the test of time. Test them out to check they look how you'd like them to. If you're going to be asking your guests to sign their names on top of their fingerprint, make sure you test the pen out at writing over the printed ink too! I always advise that your fingerprint artwork is supervised whilst your guests are adding their prints to it. At a wedding, you could ask your ushers or the staff at your reception to assist with this. They can help tell your guests what to do if they are unsure. 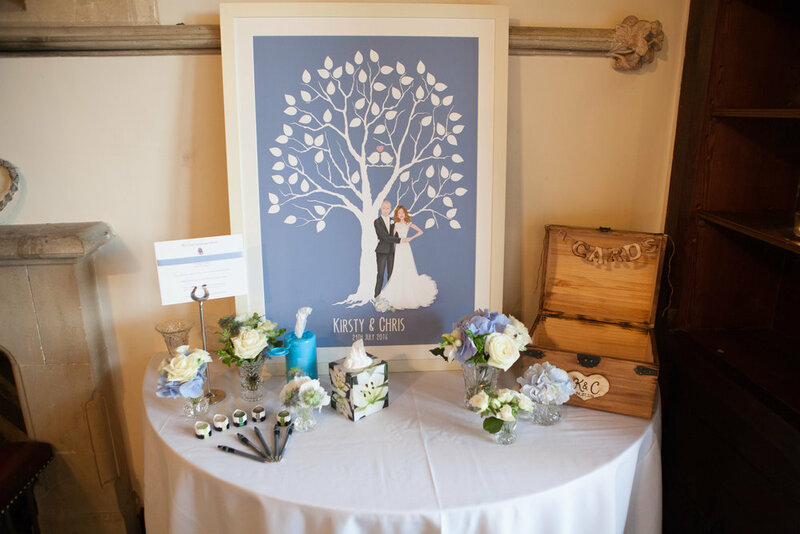 It works well to ask wedding guests to add their prints to the artwork as they enter the dining space for the wedding breakfast. That way you will make sure nobody forgets to contribute and then you can store it safely somewhere for the rest of the day. This will save any disastrous smudges or crumples happening (often caused by runaway children or tipsy family-members)! The best way to display your artwork is in a frame (whether it’s a shop-bought one, or a handmade frame I've had made for you), with the glass/clear styrene removed. If you keep it in the frame, it will save the paper from getting 'dog-eared' at the edges and prevent it from rolling up. You can position the framed piece either on an easel or flat on a table-top. Once everyone has added their fingerprint or message, the glass can be put back into the frame to keep it clean and protected, until you are ready to hang the picture. Keep babywipes close-by (for your guests to clean their inky fingertips) and a little bin or basket for the used wipes to go into. It is also a good idea to keep a few sheets of paper or a notepad on-hand to dab off any excess ink, or use to practice on before printing onto the artwork itself. Please do get in touch if you’d like me to illustrate your custom Fingerprint Guestbook – I would be delighted to bring any ideas you have to life. Think about incorporating yourselves, your pets or your wedding venue into the design to make it entirely unique and personal to you. If you need some inspiration take a look at my fingerprint gallery. If you have any questions, please get in touch, or fill in my get a quote form. Newer PostThe Importance of Local Promotion.